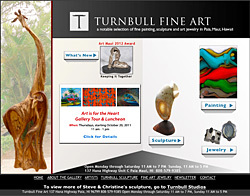 Take the road less traveled and see a “diamond in the rough.” The Turnbull family,internationally recognized master sculptors Steve and Christine, invites you to watch them work in their studios. Come visit their gallery featuring the art of 20 of Maui’s finest artists. Walk with your family through the Sculpture Garden.